The Think Blue Maine campaign works to educate about stormwater pollution. 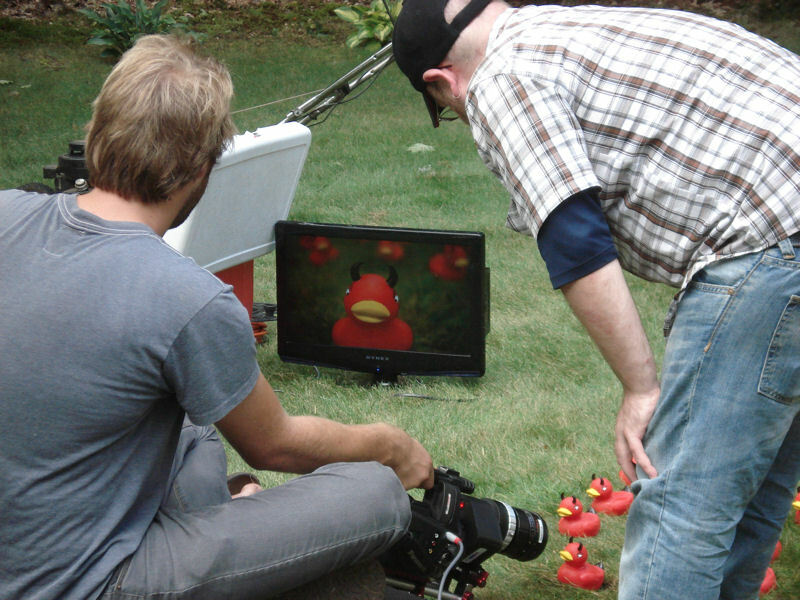 In 2011, the group debuted a video using devil ducks to illustrate how lawn-care products can runoff private property into waterways. Photo courtesy of Think Blue Maine. Rubber ducks aren’t just for bath time anymore. A yellow rubber duck and red devil duck take center stage for stormwater educational messaging distributed throughout Maine. A total of 30 nonprofits, state agencies, and municipalities have joined together through the Think Blue Maine campaign to educate state residents about polluted runoff. “The goal is to get people to recognize that the water that falls on their property doesn’t stay on their property, and that as it runs off, it picks up pollution and carries that directly into our water,” said Jami Fitch, stormwater outreach manager for the Cumberland County Soil & Water Conservation District (Windham, Maine). The rubber ducks in the campaign’s hallmark public service announcements (PSAs) represent various types of stormwater pollution such as trash, pet waste, and lawn chemicals. “It’s so hard to see nonpoint source pollution, so the rubber ducks created that visual image of the pollution,” Fitch said. Local stormwater efforts include a youth program where Greater-Portland area, middle-school students learn about stormwater-friendly, lawn-care practices. Photo courtesy of the Cumberland County Soil & Water Conservation District (Windham, Maine). Phase II of the U.S. Environmental Protection Agency National Pollutant Discharge Elimination System includes Municipal Separate Storm Sewer System (MS4) permit requirements. The permits required development of statewide outreach plans to increase awareness of stormwater pollution. So in 2003, organizations throughout Maine decided to band together and form Think Blue Maine as a way to accomplish more together than each could on its own, Fitch explained. Participating organizations are divided into the four regional groups of Greater Bangor, Greater Lewiston/Auburn, Greater Portland, and Southern York County. All work both on a statewide media outreach campaign and on regional campaigns. On a local level, many are working to change lawn-care behaviors, Fitch added. The yellow duck takes center-stage on all stormwater materials created by Think Blue Maine, including its logo. Photo courtesy of Think Blue Maine. After first forming Think Blue Maine, participating organizations coordinated a mass-media campaign centered on a yellow duck PSA, which had been created by Think Blue San Diego. Think Blue Maine received rights to alter the PSA, replacing the voice-over and logo to tie it to Maine. After airing the PSA on local television stations in 2004, the image and message stuck with residents, Fitch said. To determine the tools and messages needed for effective outreach, the Maine Department of Environmental Protection surveyed residents in focus groups. Because focus group participants were able to recall the yellow duck PSA without prompting, a marketing group recommended that the campaign continue using the image. So Think Blue Maine began using the yellow duck on all of its stormwater-related materials and featured it on the campaign’s logo, Fitch said. In 2010, Think Blue Maine continued to build on its yellow duck PSA and complement local efforts by developing a devil duck PSA. For the video, devil ducks represent fertilizers and pesticides washed from lawns into storm drains and out into waterways. “We’re really happy with the result of that ad,” Fitch said. In the public service announcement videos, rubber ducks provide a visual representation of nonpoint source pollutants such as pesticides, pet waste, and trash that can be washed into local waterways during storms. Photo courtesy of Think Blue Maine. In March, Think Blue Maine launched a new television and online advertisement campaign. During the next 4 years, both PSAs will air on cable stations during the spring through fall. Even though this will be the fourth media campaign using the videos, it also includes online ads, lasts longer, and is more focused to reach the target audience, Fitch explained. “We’re doing a more targeted approach this time,” Fitch said. In an effort to reach local, college-educated residents between the ages of 35 and 55, the duck videos will air on cable stations most likely to reach this audience. The targeted group includes news, sports, and home-improvement stations. Online ads will appear on local and national news websites as well as outdoor activity and do-it-yourself websites, Fitch said. Both types of ads direct residents to the Think Blue Maine website. Online, people will find information about how to reduce stormwater pollution coming from their property. The website also is a resource for stormwater managers and includes background on the campaign; information about stormwater pollution and regulations; listings for related organizations and information; and many different free resources such as fact sheets, brochures, pamphlets, door hangers, stormwater drain stencils, PowerPoint presentations, logos, advertisements, and commercial transcripts. Because the campaign’s efforts — funded by contributions from the regulated MS4 municipalities and nested entities — are part of the public domain, all resources including the PSAs can be shared with anyone. “We are happy to share our ads as much as we can. We just want the message to get out there,” Fitch said. In each region, organizations work to educate citizens and change behaviors through such efforts as storm drain stenciling, community events, literature distribution, adult-education classes and events, and local business collaborations. The Greater-Portland area works with lawn-care and garden centers to educate staff so they can supply information to customers, distribute fact sheets and informational brochures, host healthy lawn-care classes, and tag preferred products with the duck logo. “The ducky is a visual help for people to recognize the products that are better for use,” Fitch said. Citizens participate in Portland’s annual Urban Runoff event, which raises awareness about water pollution and money to support clean water education. Photo courtesy of Capstone Photography (Middlefield, Conn.). 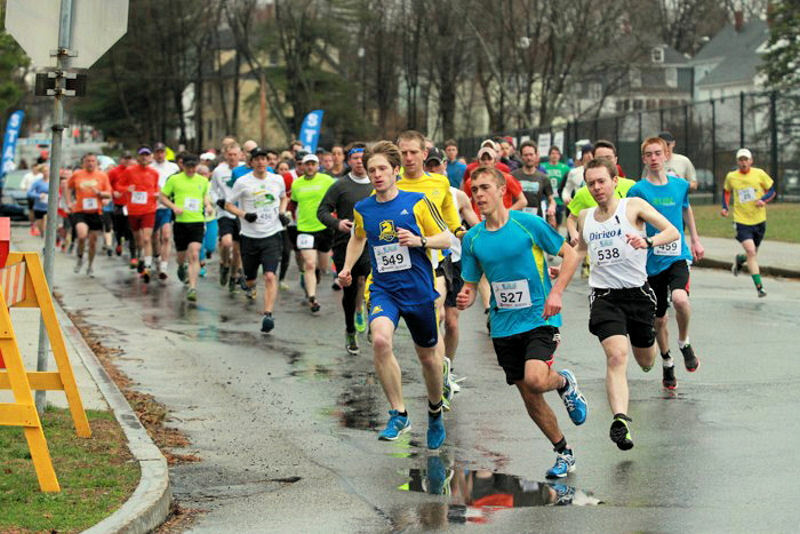 Portland also hosts an annual Urban Runoff 5K event where community members run or walk to raise awareness about water pollution and money to support clean water education in local schools. 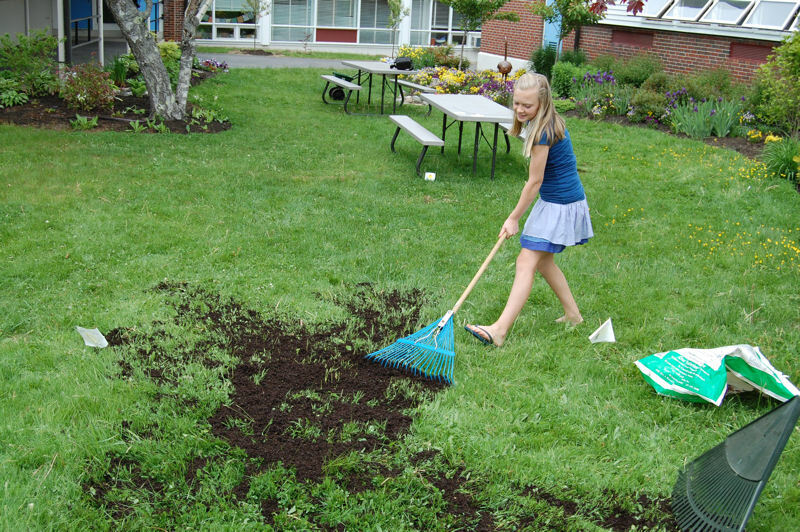 Education efforts include a youth lawn-care program at a local middle school. For the program, 6th-grade science students form mock lawn-care companies, are assigned a lawn-care practice, write a paper, and give a presentation on the stormwater-friendly way to perform the practice, Fitch said. “That has been such a wonderful program for us. We’re educating our students about how to keep water clean in the context of maintaining their lawns … but we’re also educating their parents. We’ve had parents sitting there during their kid’s presentation, taking notes,” Fitch said. The region now is working to make the program more easily replicated in other communities.